In this post we will give more information about the performance indicator “cycle time improvement suggestions”. Other performance indicators for continuous improvement are described here. Cycle time (a typical Lean term) is the total time from the beginning to the end of your process. 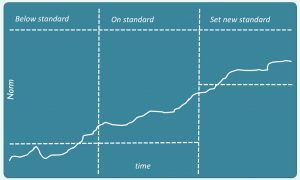 Combined with takt time it gives you information about needed capacity for your improvement process.